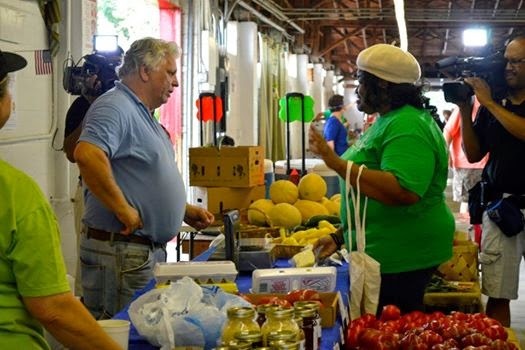 To prove that you can eat locally grown food AND stay within your grocery budget, the Dixie Classic Fair Farmers Market and the City of Winston-Salem is sponsoring the $20 Challenge twice a month from now through September 2014. 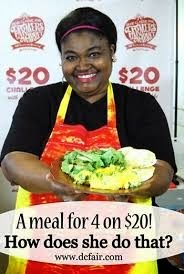 I stage a live cooking demonstration in which I will prepare a meal that could feed a family of four for $20 using ingredients I buy at the market that day. This week I was joined by my friend and fellow blogger, Amanda Clark of Cuisine And Screen. 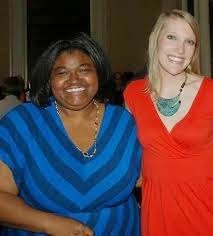 We met two years ago at Fire in the Triad and became fast friends. It was SO much fun having her on set and getting SPICY with our tacos. I'm wearing the SAME dress in this week's show! Ha! I honestly believe this is the best $20 Challenge episode yet. I felt like I was in my element and my personality really came through. I have to admit: while I was cooking, I had no idea of what I was saying. I hoped it translated to camera and thankfully, it did! Watch it below or by clicking this link! I always try to keep the $20 Challenge recipes simple, easy and kid-friendly. This week was no exception and I managed to save a little over $4 which could be used to purchase taco shells and additional garnish not sold at the market. Heat grill pan or cast-iron skillet over high heat. Use a scant 1/2 teaspoon of oil on the pan. Sear on one side until golden brown and slightly charred, about 3 to 4 minutes. Turn the steak over and cook to medium-rare doneness, about 3 to 4 minutes longer. Let rest 5 minutes then slice against the grain into 1/4-inch thick slices. Fill each tortilla with 3 to 4 pieces of meat, tomato salsa, Greek yogurt, cheese and any other condiments you like. Sprinkle ingredients on fruit to taste.